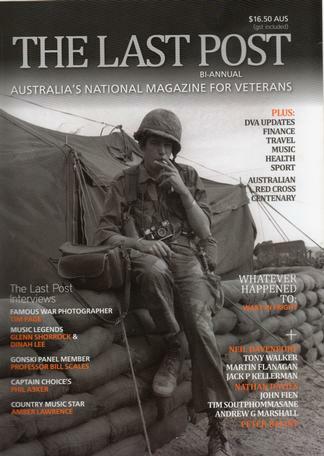 The Last Post is Australia's national bi-annual magazine for veterans. Released for Anzac Day in April and Remembrance Day in November, the magazine provides DVA and RSL Updates for readers. As well we feature regular interviews with well known Australians and focus on businesses and charities that are helping to keep the Anzac spirit alive. Travel, finance and Regional Matters also appear. Available in glossy hard copy and online, The Last Post circulates throughout Australia through councils, governments, state and local libraries, Australian War Memorial, subscribers, RSL's, High schools, supporting corporates. The Last Post also goes to Australia's overseas embassies and RSL branches. Subscribe now and help our veterans!